The Fancy Color Diamond Index for 2018, published by the Fancy Color Research Foundation (FCRF), showed an an overall increase of 0.2%. 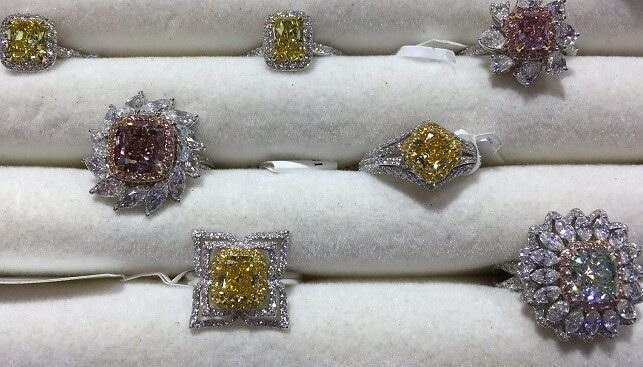 In the fourth quarter of the year, Fancy color diamond prices “showed stability across all sizes and saturation”. In 2018, prices of blue diamonds went up 4.1% (1 to 1.5 carat were up 9.1%), yellow prices were down 2.1% (Fancy yellow diamonds decreased 3.9%) and pink prices remained stable. In addition, all Fancy Intense and Fancy Vivid diamonds increased 0.7% and 1.5%, respectively, while the Fancy category decreased 1.4% in 2018. Jim Pounds, FCRF Advisory Board member, said that in the last three years there was a substantial amount of vivid yellows coming to market, mainly from the ‘Misery’ Pipe at the Ekati mine in Canada. However, now that the mine is transitioning from open pit to underground operations, there will be “a substantially reduced amount of stones available during 2019”. He concluded by saying that the FCRF is anticipating “a slight increase in vivid yellow prices”.